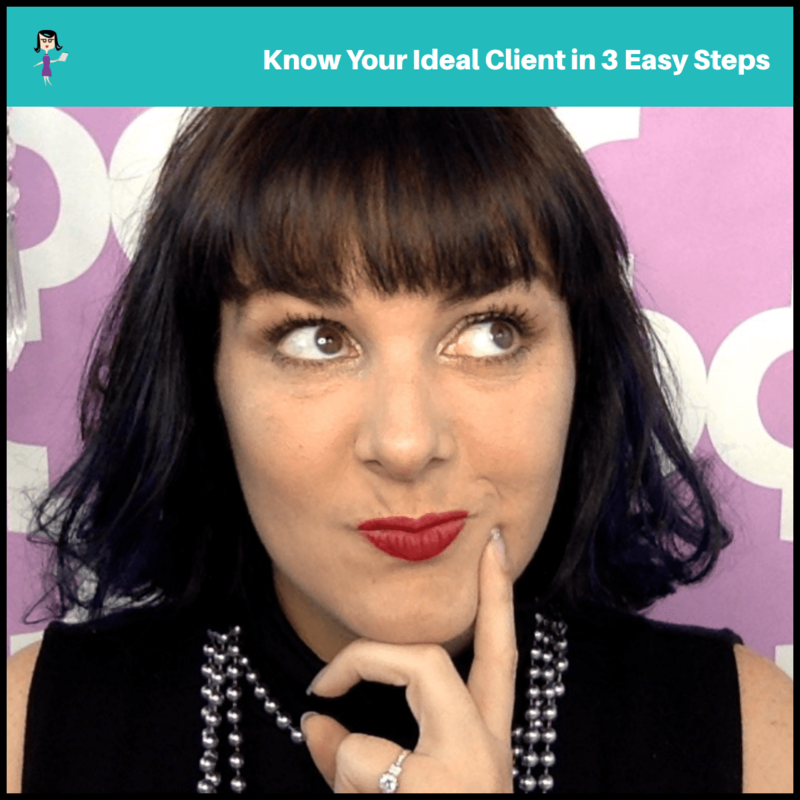 Know Your “Ideal Client” in 3 Easy Steps. Is anyone listening? Do you feel like your message is floating away without actually making an impact? It's could be because you don't actually know who you are speaking to. In business there is always mumbo jumbo about knowing you “client avatar” and “ideal client.” IT'S TRUE!! If you speak to everyone, you'll speak to no one. Buuuuuuuuut, you don't need to spend loads of time creating a perfect client avatar. In this video I show you an easy way to get clarity and know exactly who you are speaking to, so that you can bring in more of the “right” leads. Make a list of REAL PEOPLE that you have supported as clients, or that you would like to work with. Find those on the list of REAL PEOPLE who need your solution and who would be willing to pay for it. Then, go out and develop a content plan that supports that one person! Speak to that 1 person and others will listen, understand you, and view you as the authority in your space. Yay!! Yes yes yes!! I want in!! Help folks train their dogs. Matters because so many folks struggle with it. Yes because folks can get free dog training info off the internet for free. But its not all good info. I offer stylish self defense products,, and it matters because everyone wants to be safe, and keep their families safe! I offer professional makeup skills, headshots and badass on camera skills..because how we look and sound matters! When you say content plan, are you talking about making one specific for 1:1’s? Or in general? Got it! This was a great video!! Aware clients are the best, and I love your comment on education! So true.. I went to a small network a few months back and I got deer I headlights on Facebook Live’s..Find your tribe! Ha!!! They probably need you – but just didn’t understand. Ha! Molly what camera are you using? You look awesome! I just want you to know that even though I am not “performing” I use your tips daily! You rock! I’d love access to the new masterclass woo hoo! I would love the course! Yay, I want in on the Master Class! I help busy moms find time in their busy schedules to take care of themselves in only 30 minutes a day so they can be happier, healthier and free. Does it feel weird though when you ask people to give feedback then u do a video about that problem then they may feel used?? Does that make sense?? I am in Miss Molly this was great!!! Accelerated Quantum Healer & Freedom Leader. Kaayla works with people to end their suffering. People who know there is more & they don’t know how to get there & they have tried. Bridging the gap between higher levels; guiding and assisting you to release the entanglements & beliefs of life times, assisting in shifting the frequency you are vibrating out & removing entities that can be the cause of anxiety; stress; illness; injuries and more. Private 1/1 sessions or for those really ready to jump in and get on the fast track she offers the accelerated freedom journey. Activations and downloads begin to happen as, with Kaayla’s guidance, her clients remember what powerful creators they truly are. FREEDOM! I am a distributor of Kangen water filters that can change your water experience and how you feel in general. It is a unigue water filter that provides different PH levels not only for drinking but for cleaning and disinfection your body and house with out any chemicals involved! The water that we drink matters first of all for our health because we are 75% water in our body. It is a medical device used in hospitals so as you understand it is not a common water filter! I love the health benefits of it and it is also a huge income stream cause the company has the most unique compensation plan for its distributors. Molly Mahoney 🙂 I had seen this video before and loved it!!! is this answer of mine specific enough for the water filter? We are going to really talk about this on our call. 😉 This is super specific about the product and its benefits, but I still don’t know who your ideal client is. Can you tell me the names 3 people that you’ve supported in your biz? Hi Whitney! This is Shanon, Molly’s Assistant. Molly is using https://belive.tv . She loves it for her live videos! I would like to know more about the Masterclass. Yay! Want in on the masterclass!! I need the Master Class..!!!!! I need technical help SO badly. I want to be just like YOU. You are great! Love your enthusiasm, clarity, ease on camera 🎥!! I have ALWAYS had terrible stage fright. I So need this class. Thanks Deedi! That’s very sweet! people achieve a clear sense of what they want to accomplish in their own way! I do live video but I need to get help with a tune up. I’m a paparazzi consultant, but I have other plans too. I offer skincare & makeup online!!! Want to attend your video class. Would we be able to have access to your deep dive spreadsheet? Makes a lot more sense than “avatar” a made up person. I help small biz owners get found on Google without PPC ads.